I got nominated for the Liebster Blogger Award, and I have absolutely no idea what it is! But apparently it involves answering a bunch of questions, so I’ll do that!I was nominated by Lise of Red Riding Hood. 1. What is the next doll you have planned? 2. Most people in the BJD hobby have characters for their dolls. Assuming you do too, how did the character come to be? As a figment of my weird imagination I believe, haha? Sometimes I dream about characters, other times I just get ideas that either get tossed out or worked on. 3. Do your dolls have a theme song and if so which one(s)? That’d be Skype, where we have a close-knit group of friends who like to chat about both dolls and life in general. We’re all pretty strange, but we create a safe place for all of us to talk about problems or just wanting that new gorgeous doll. 5. What do you like the most about the doll hobby? Honestly? Making friends. The less pathetic answer: Photography and being able to show my characters even though I’m not able to draw. 6. What do you like the least about the doll hobby? It’s so expensive, which I absolutely hate. I don’t actually like spending money! 7. Do you dream of any kind of doll that does not yet exist? Maybe a peacock anthro doll? Or an even cuter, four-legged dragon? I don’t even know how the first would work, but yeah, haha. 8. Do you have any irl friends who share your hobby? 9. If you could get 1 free doll right now, which doll would you choose? 10. Have you gotten any new friends through the doll hobby? Yes, several. I really like having something to bond over, even if we’re quite different in other aspects. I tend to gravitate towards people I have other things in common with as well, though. 11. Honestly, do you think you’ll ever lose your interest in dolls? Yes, absolutely. Some day it just won’t hold the same magic for me, and I’ll slowly drop out. I’ve never considered myself an impulsive person. I’m not the type to book a last minute vacation, because I need at least a month to be stressing out about it. When I decide to do something, I go through with it (like continuing in law school despite realising second year that it probably wasn’t for me – but at this point I’m almost done with my law degree). My older sister is far more the impulsive one, though that isn’t really saying much, and when we go shopping I usually come home with things I really like but wouldn’t have bought unless she was there to tell me to “Buy it!”. I’m the type who’ll go home and read reviews and consider for a very long time whether I honestly want to spend $20 on that lipgloss. But when it comes to doll characters, I’m impulsive. I’m usually always working on a new character or trying to get to know an old one better. (Often spurred on by Lise who always has a new character in the works!) I’ll decide on a whim whether a character stays or goes, and usually it really comes down to whether I’m bored with the character or not. If I decide to scrap a character, the doll housing it better hope that I make a fitting new character, because if I don’t, I’ll sell the doll. Up for consideration is currently the story of Rain and Kiri (LittleFee Ante elf and LittleFee Leah respectively), but that partly stems from boredom and partly from the fact that I’m considering whether LittleFees are also too big for my taste. I’d still keep Ozzie though, I love her character too much. When it comes to the actual dolls, I don’t feel that I’m super-impulsive, but it is a little worse than in other aspects of my life. 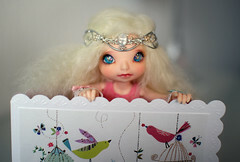 Sometimes a doll just comes up and I have to have it, but I can usually talk myself out of it – Lati Kentauros being an exception that I probably shouldn’t have made. Some people have rules that they can’t buy a doll they don’t have a character for, but seeing as I’m usually being inspired by the sculpt, that wouldn’t really work for me. Other people have rules that they can’t buy another doll until they’ve sold one off, and at some point you just don’t want to sell any of your dolls and the buying stops. Since my collection really isn’t that big, I don’t feel that rule will work for me, although I’m currently trying to practice it with my Momocolor Lucy and Lati Laches (none of which seems to be able to find a new home). I guess my rule mainly is: Sleep on it for as long as possible (at least 2 weeks) and only make a decision when you’re completely certain that you can or can’t live without having this specific doll in your life. Are you an impulsive person? How does it show? Do you have any doll-buying rules?